Though both tortoises and turtles are reptiles of the order Testudines, some key basic differences distinguish one from the other. A tortoise (left) and a turtle (right). Though both tortoises and turtles are reptiles of the order Testudines, some basic differences distinguish one from the other. Each belongs to a different family classification. The primary distinguishing feature between the tortoise and the turtle is where they live. 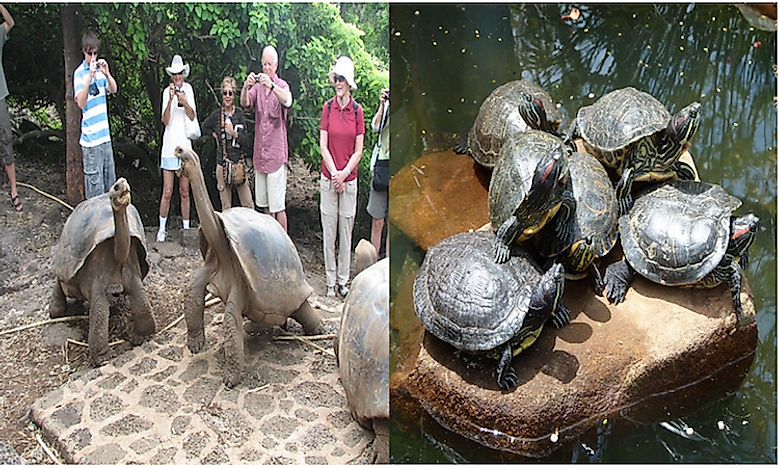 Tortoise ordinarily dwells on land while turtles dwell in the water for part of their life. 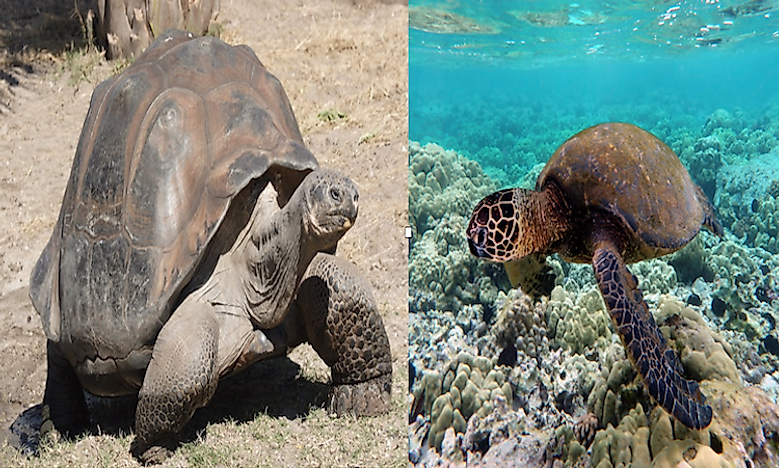 Both the turtles and the tortoise belong to the oldest groups of the reptiles dating back to 220 million years. They are found on all continents except Antarctica. Here we will explore the facts that help us answer the question "What Is The Difference Between A Tortoise And A Turtle?" The bodies of both the turtle and the tortoise are covered with a shell known as the carapace. The tortoise is larger than turtle and has a dome-shaped shell while the turtles generally have flat and streamlined shells. 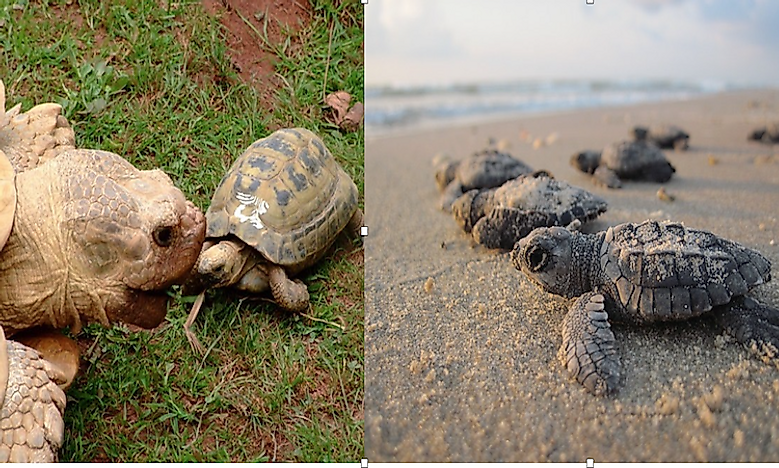 The shells of the tortoise are bigger and heavier as opposed to the turtles whose shells are lightweight.The tortoise has small and sturdy Feet and their legs are bent, while the turtles have webbed feet with long claws adapted to swimming. The tortoise is mainly found in Africa, Asia, and some species are found in the Americas. The turtles on the other hand are distributed mainly across America and Africa. The turtles spend most of their lives in water, and their feet are adapted for swimming. Sea Turtles (Cheloniidae) are adapted to aquatic life, and they hardly leave the ocean water except for the females who visit the shores to lay eggs.Green Sea Turtles leave the sea only to bask on the reefs and beaches. 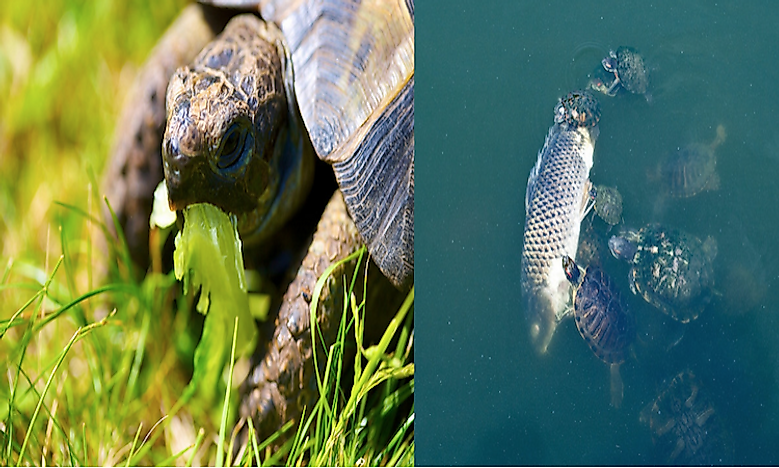 Some turtles live in fresh water lakes and rivers or ponds. During cold weather they can barrow in the mud and go into torpor until the weather change in spring. The tortoises are mainly land dwellers and have strong feet. Those living in hot habitats and dry places use their feet to dig into the ground for burrows using their forelimbs. As we attempt to answer the question "What Is The Difference Between A Tortoise And A Turtle? ", we need to explore the diet of these two types of creatures.The tortoise is mainly herbivore, although others prefer live food, while the turtle is mostly omnivore eating leafy vegetation, fruits, and meat. The meat is from small animals like fish, insect, and larvae. Turtles come to land only to lay eggs, and the mother will leave to the sea immediately. The hatchlings will stay in their nest for 90 to 120 days all on their own. Unlike the turtles, the mother tortoise will provide protection for the young for almost 80 days after hatching. The tortoise lay between 1 and 200 eggs depending on the species and the incubation period vary from 45 days to 18 months depending on the species. The sea turtles have a lifespan ranging between 60 and 70 years and require almost 50 years to reach maturity. 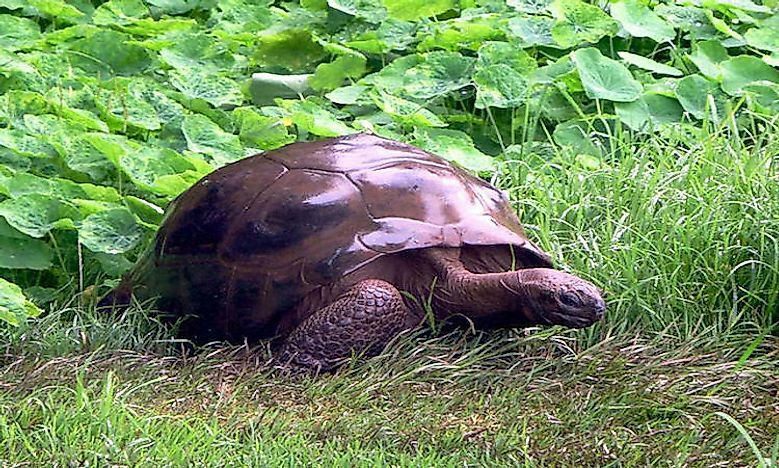 Other common turtles have a lifespan ranging between 20 and 40 years.The tortoise, on the other hand, live much longer exceeding 80 years, and some have been known to live up to 150 years.The oldest living tortoise is called Jonathan living in the island of Saint Helena in Seychelles he is 184 years old. The tortoise was brought to the island in 1882 where he is still living today. The age of Jonathan is an estimate based on the photos taken of him in 1902, and expert postulates he could have been 50 years old by then. Jonathan, the tortoise, is still sexually active an indication that he could still live for many years to come. There are records of the oldest tortoise in the world to have lived to 255 years in India. There has also been a mention of a tortoise that lived to 326 years. What Is The Difference Between A Monotypic And A Polytypic Species?